Recently, texturizing hair sprays have taken the beauty world by storm. 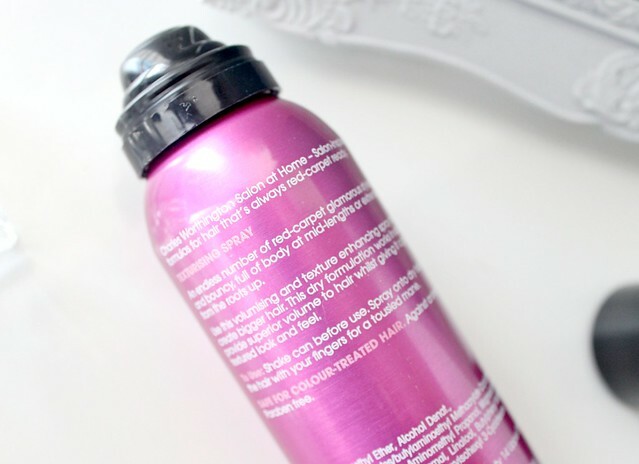 It all started with the ever so expensive Oribe dry texturizing spray that was raved about by top beauty bloggers such as Vivianna Does Makeup, Lily Pebbles and Zoella. It can be found in the likes of Space NK for a whopping £39 and I’m not going to lie, after all the hype surrounding it, I was almost tempted to splurge. However, after a bit of umming and ahhing, I decided £39 is a little excessive for something that lots of people would consider a glorified hairspray. 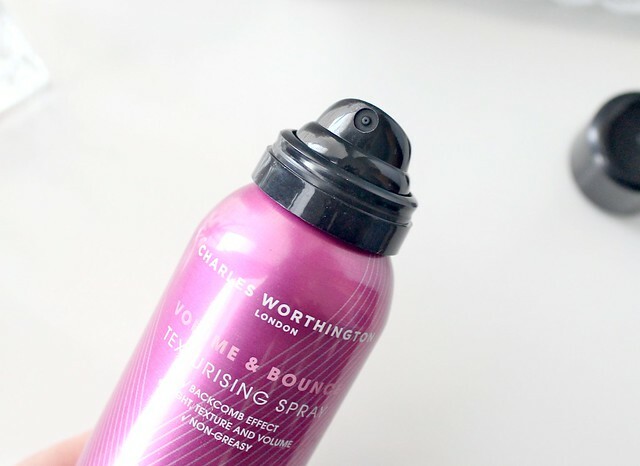 With this being said, you can imagine my joy when Charles Worthington released a more purse friendly version of the ever so popular hair texturiser - their 'Volume & Bounce texturising spray'. The reason I was so curious to try a texturising spray in the first place is because I love a bit of volume in my hair – it helps it look more styled and I often like to go for that messy bed head look which textursing sprays can help to achieve in a more natural way than hairspray or volumising powders. Do those powders leave anyone else's hair feeling like you’ve not washed it for a good few weeks? Never a good thing! Now I wasn’t expecting to be totally blown away by a hair product because other than Moroccan Oil, I’ve never found any that I always go back to and consider ‘must haves’. However, this one may well be an exception. Since buying it a few weeks back – I’ve used it almost every single day! 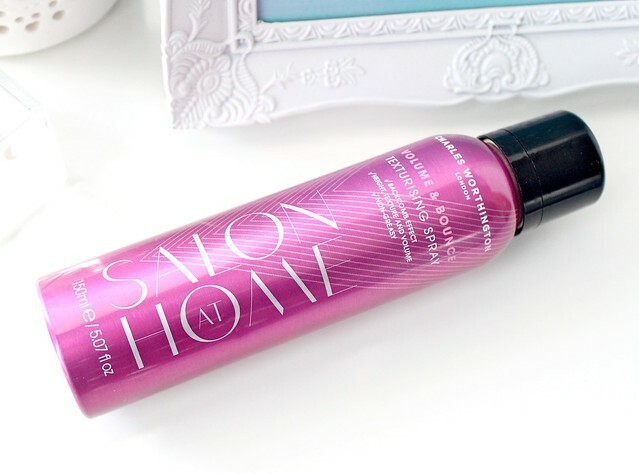 It’s the perfect product for every kind of hair day - if my hair is having one of those 'just been washed and has no volume' moments or whether I’ve just rolled out of bed and need a quick hair fix – this product is my hairs best friend. All I do I spritz it onto the mid lengths to ends, scrunch it up with my fingers and leave it to do its thing. It adds instant texture and volume and allows me to dash out of the house with hair that feels somewhat styled – despite making very little effort. In terms of how it feels in the hair – it adds texture as the name would suggest but doesn’t make it feel weighed down or stiff like a hairspray would. I can definitely tell there’s product in my hair when I’ve used it but again, it just feels like it has more texture – not greasy or heavy. It doesn't add any colour either like a dry shampoo - its completely transparent and can't be detected in the hair. Its worth noting that my hair does need washing more frequently when I’ve been using it as it can start to make my hair feel dry. However, this isn't a big deal for me as I tend to wash my hair every other day anyway. I also need to mention how amazing this product smells – I could continue using it for that reason alone. Its like perfume for my hair! Overall I’d say this is a great product and one worth trying if you want to add an extra something something to your barnet. It’s a good one for lazy girls, people who lack volume or people who like that messy texturised look. So that's the majority of us then? Its definitely going to be a staple for me in the Summer when I get even lazier with my hair routine – who can be bothered styling their hair when its hot? No – just me? Do you like adding texture to your hair? What's your favourite texturising product? You can find this Charles Worthing one here for a very reasonable £6.99. Charles worthington products always smell amaze! I have this and I really like it but I find I need to top it up quite often. Such a good price, thanks for your review! Heard such great things about this, will definitely give it a try! I love adding texture to my hair and this product seems like a much better price than the Tony and Guy one. I love Charles Worthington products too, they are an amazing brand! This sounds like the ideal product for me, I really struggle with my hair after I've washed it do this would be perfect! I was tempted to splurge too, but so glad I didn't! This really does the job! What a great dupe, I have to try this product I looks perfect for my hair type. I have never tried a texturizing spray myself. I am one of those girls where doing my own hair is a lost cause! I am getting better at it but dang! This girl right here needs some help! lol...One of these I will have to give texturizing spray a go! I love this product. Really helps to give my hair great texture, and volume. I have also written a review of this product over on my blog. I have nothing but good things to say about it! Love it!